But one difficult aspect of the language may come as a surprise: the number system.Japanese does numbers a little differently than English. 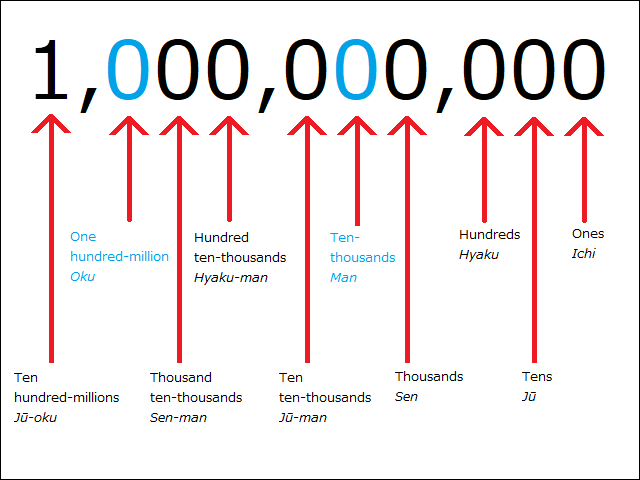 Instead of being based on thousands and getting a new word every three-digit places (thousand, million, billion), Japanese is based on ten-thousands and gets a new word every four-digit places (man — ten thousand, oku — 100 million, cho — one trillion). This can get confusing quickly. For example, if you’re trying to count how many hairs are on your cat and you get the number 57,680,000, trying to convert it into Japanese could be a nightmare, since the commas mean nothing. (For reference it’d be 5-thousand 7-hundred 6-ten 8-ten-thousand — go-sen nana-hyaku roku-ju hachi-man). -- There’s only one place in Japan where this kind of sushi isn’t red, but why? Surely it would be easiest to understand both - one for informal conversation and one for mathematics. I might say "fifteen hundred" to mean 1,500, but I would never write 15,00. First it's not "like English". It's like the rest of the world. Second, If you have time to "count the hairs on your cat" you have too much time on your hands. Get a job. Third, Loan words in Japan are already confusing and incorrect, why add fuel to the fire. Finally, Japan is a country that conducts business internationally. Why confuse the rest of the world? "Why confuse the rest of the world?" The rest of the world isn't confused, Japan is. I guess it helps them claim 'misunderstanding' when companies get busted for falsifying data? Here’s one thing I noticed upon coming back here, the Japanese method of counting is inferior. Idiocy. Stop messing with numbers and also start using normal years like 2018 instead of years based on the emperor's reign. First I must say this is not a Japanese system; I believe its originally from China. Whereas I can understand the frustration of people confusing Western and Eastern ways of reading numbers, I strongly believe changing the comma position will just work to confuse young minds even more as the world becomes more international. Outside Japan who understands the concept of 万 or 億? There’s pride in culture but don’t limit young peoples’ minds. However, there’s more to internationalizing. Is one thousand dollars 1,000.00 or 1.000,00? 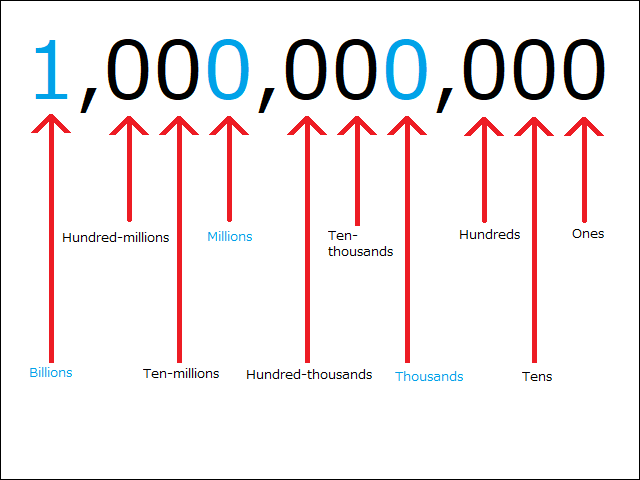 Where’s the comma in the English language billion, 1,000,000,000 or 1,000,000,000,000? Let’s work toward A single world standard. If they want to use curly commas, not used in Japanese, they should put them in the right place. Yeah, nip this nonsense in the bud stat. I don't think there is any consistent usage around the world. Some countries write 123,456.789, others write 123.456,789 etc. It would be helpful if the Japanese would decide on one format and stick with it, whatever it is. Although counting of large numbers tends to be done in 10000s I often see accounts using thousands. Just team up with China and Taiwan to start using this new system. Once China gets in on it, we have a billion people use it. The world will have to recognize its usage. Japan: Obsessed with conformity, but only within the borders of their own country. But as soon as any foreigner questions this method it'll be labeled as an attack in Japanese culture. There’s a difference between reading big numbers and international standards. That seems a fair comment. But wouldn't it be better to use a different separator character for both cases. So 57,680,000 and, for example, 5768:0000. "I might say "fifteen hundred" to mean 1,500, but I would never write 15,00." I would say "one thousand five hundred" for 1,500 and of course never 15,00. People should be fined if they ever write 100,0000 instead of 1,000,000. Except in this article, lol. "Rent here costs 5,0000 yen a month. I bought a secondhand car recently for 50,0000. By the way, can you change 1,0000, please?" Yes, frightfully useful. Not. This is like trying to go backwards to the 'good old days' when samurai were men who read from right to left. But keep going and you reach ancient Chinese influence. Nostalgic, I grant, but why? A lost cause and a non-starter, IMHO. Either keep the current system - because people are used to doing the 'ichi, jyu, hyaku, sen, man' dance to work out a big number- or be wild and officially drop the current system in favour of 'thousand', 'million', 'billion' etc. Moving the comma is just a fudge. Why would we expect people + companies to function with such a confusing system, when we can't even trust people to understand roundabouts. There is no reason why speakers of Japanese should have to write commas every three places when the language doesn't work that way. I've seen Indians write things like 12,34,56,000 because they have words for 10^6 (a lakh) and 10^8 (a crore). That's how they say them, so that's how they write them. Just because the European countries have settled on a thousand=based system -- even the Greeks write "100,000" even though their language allows them to say "ten myriads" just as the Asians do -- doesn't mean that everyone in the world should go along. The SI (metric) system proposes to solve this by not having commas or periods at all; spaces (10 000) or nothing (10000). The latter is probably the only way to be fair to speakers of every language. Well, every language that uses base ten, that is! Well, every language that uses base ten, that is! Those were the days. £5-7-6 (or was it £5-7/6). I, for one, will be ready to welcome our 12-toed and 20-fingered alien overlords. Imagine all the relearning WE would have to do? The period when one system is phased out and the other phased in could send the markets for a rollercoaster ride. “Sorry, we used the wrong separator”. Leave good enough alone. LSD, Albaleo! £5 7s 6d it was. Five pounds seven shillings and sixpence. Base 12 was so much better. Converting it into the new system as 5768,0000 is way easier to read in Japanese, because the comma lines up with where the new number-word is used. No-brainer. It's simple and rational. I've been doing it for years when dealing with numbers in Japanese while doing separate-by-thousands when dealing in English. No confusion. It's good to know that Japanese children are finally being taught a rational way. You don't need mental contortion for counting numbers. I don't think there is any consistent usage around the world. Indeed. That is why office software that is available in versions for more than one language has an option to switch a whole range of things including decimal format, comma placement, date formats, etc. to the conventions used in a particular language. In just one country that has two official languages, the conventions for numbers are very different. Only someone who is mono-lingual would think Japanese usage was peculiar because it is different from the (American) English conventions they are familiar with. Even within English, there are differences. The British billion and the American billion are quite different. Personal weight in Britain is still typically stated in terms of "stone" (14 pounds). And, as others have pointed out, there is still nostalgia among some in Britain for the system that existed up until 1971 of pounds, shillings, and sixpence. £5 7s 6d it was. Right, but I thought there was a shortened version. (Corresponding to five pounds seven and six.) Age and LSD may not be the best combination. That is why office software that is available in versions for more than one language has an option to switch a whole range of things including decimal format, comma placement, date formats, etc. to the conventions used in a particular language. The British billion and the American billion are quite different. Except that no-one in Britain, except for 23.7 university linguistic professors, has ever used a British billion. Why? There is an international standard! This does not help kids be competitive in the world. Maybe one in 10 kids will try to go out to be 'competitive in the world'. Actually that goes for most countries. I know that i am the only one out of my school friends who works in a different country now. And those that do go for overseas jobs would have no trouble learning the different comma systems, just as they would have to learn the language.